How to Make Money with MaxBounty? What I Like About MaxBounty? MaxBounty Review - What Others Say? If you have encountered affiliate marketing programs such as Wealthy Affiliate, you would have a bit of an idea of how MaxBounty works and acts its role to the bloggers and affiliates alike. But I’m not saying there’s totally similar. They’re simply in the same industry. The difference is that MaxBounty is a Cost-Per-Action affiliate marketing company wherein they consolidate lots of industries open for affiliates with the corresponding costs of each traffic generated through various traffic sources. Whereas, programs like Wealthy Affiliate, they simply teach new bloggers about the industry itself. Nothing else. 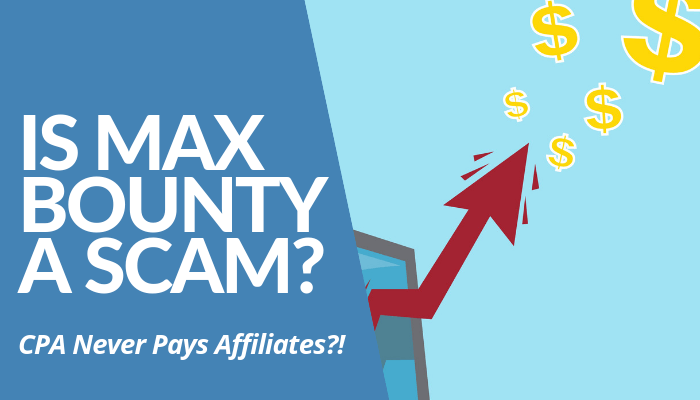 Known for paying out the highest commissions to affiliates, MaxBounty is certainly one of the leading CPA affiliate marketing programs in the past 15 years. Actively operating in Ontario, Canada, they continuously provided the best service to both affiliates and advertisers desiring to expand their reach on their target market among the billions of internet users through providing leads. Basically, unlike the typical affiliate marketing programs wherein they teach the fundamentals of becoming an effective affiliate, MaxBounty is a sort of a consolidator in which they gather the advertisers open for affiliates. Afterward, the company converts into traffic rates in accord to the generated amount of leads an affiliate gathers in different categories. 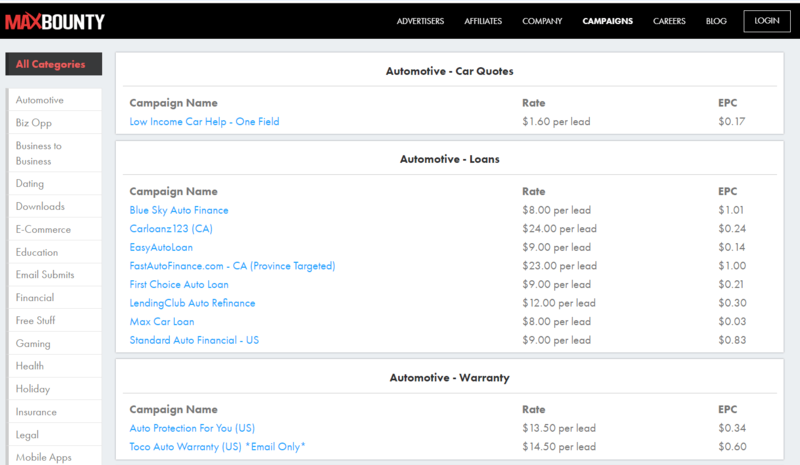 For example, a car company lead cost is worth $1.60 per lead and Max Car Loan costs $8.00 per lead. Hence, MaxBounty pays out as low as $1 to as high as $80 per lead depending on the industry campaign name belongs. To earn money with MaxBounty, first and foremost, you have to strive harder to become one of their bonafide affiliates. That’s because most of the affiliates shared their sentiments on various forums that joining the company is a bit difficult. So, you have to do a lot of convincing and proving that you deserve to become one of their company’s affiliates. Once you succeeded, you have a lot of choices to earn money. The company itself has categorized the industries which you could generate leads for them in exchange for a commission as per the corresponding cost per click rates. From car loans to travel programs, they have them all. All you have to do is to choose which of these industries your website belongs and which of these you’d like to promote. 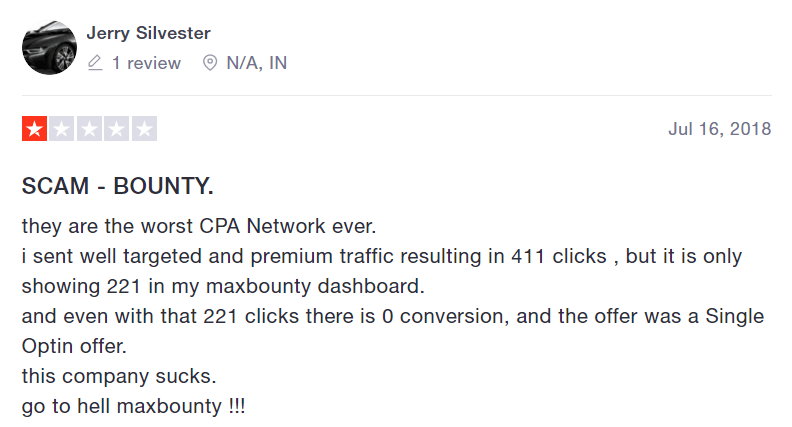 According to an affiliate named Jerry, he generated good number of traffic with 411 clicks through his website, yet MaxBounty only showed 221 on the dashboard. With the lacking number, they didn't show the number of conversions either. MaxBounty isn't only taking away the number of clicks to scam their affiliates, but they also terminate the contract if they have to pay the affiliate. An affiliate from Orlando revealed that he's excited to get an amount of $1,000 from the massive number of leads he generated, yet MaxBounty suddenly terminated his account without informing him in advance or at least giving him the reason behind the act. The same reviewer mentioned that after MaxBounty terminated his account, he never received the scheduled $1,000 payout he supposedly receives at the time. 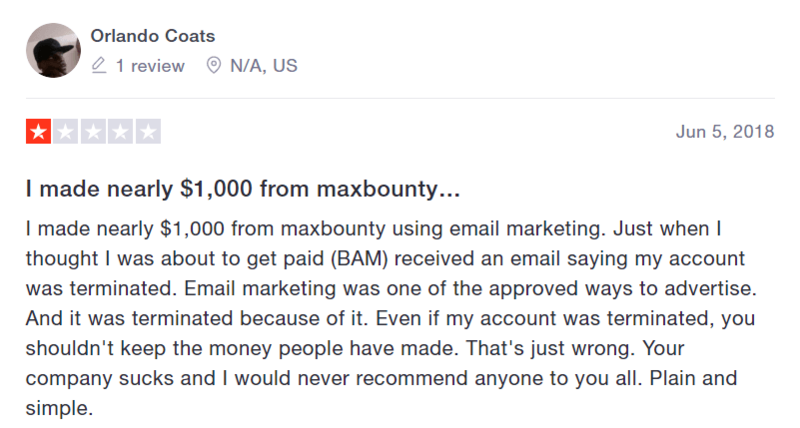 He wrote, "I made nearly $1,000 from MaxBounty using email marketing. Just when I thought I was about to get paid, I received an email saying my account was terminated...Even if my account was terminated, you shouldn't keep the money people have made." As I mentioned earlier, many affiliates warned on various forums that it's going to be a hard process to join MaxBounty albeit their negative reputation online. "I waited for 3 days to get approved for my application and finally this unprofessional guy did not even call me," an affiliate named Tiffany wrote on the forum. If you're a beginner blogger, don't even wish to become one of MaxBounty affiliates because they will never approve your application. One blogger mentioned that though the company pays out a fair amount per generated lead, their strict regulations to accept new affiliates helps them filter the quality of networks they produce. Thus, it's not for beginner bloggers at all. Otherwise, you have to search for other income-generating opportunities out there. The Better Business Bureau didn’t give MaxBounty its accreditation status although they provided an A+ rating on the site. If you want to make some risks and give this company a try and see whether BBB provides the right rating for the company, it’s all in your hands. 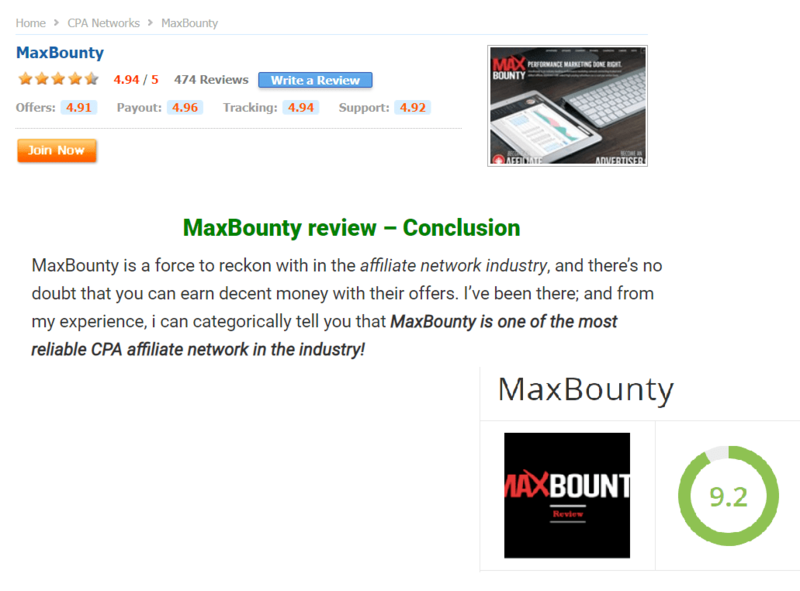 Despite the splurging number of negative reviews from random affiliates on various forums I visited, MaxBounty remains one of the leading CPA network company every blog with a large number of following recommend. Given their outstanding BBB rating, there is only 1 complaint filed against the company over the past 15 years since they operated and 3 years since they registered on the above-mentioned platform. Their strict regulations on accepting affiliates gave a way for the company to filter the kind of quality of affiliates they produce. This is for the benefit of the advertisers per se. Aside from that, they made sure that each affiliate has a large number of no-spam traffic rather a website with a legit organic traffic source. There are opposing views about MaxBounty in terms of its overall services they provide to both affiliate and advertiser, their target markets. Since 2004, the company has been trying to keep their reputation online as one of the best CPA network companies today. For whatever reasons, I found it hard to get convinced whether they really provide the best service, given the splurging number of negative feedback filed against them. In the first place, it’s hard to join the company. That alone pushes them away and find for other income opportunities. Delayed application approval is known to affiliates whenever MaxBounty is talked about. In addition to that, many reports have been collected pointing out the company’s subtle scheme implemented on its system by shaving off the right number of traffic and amount they should have been paying their affiliates. Yet, it’s not the case for most of the affiliates resulting in leaving the company for good. Nonetheless, MaxBounty has an ambitious vision for its target market with some inevitable issues that until now, they’re unsolved. As for answering the question whether they’re a good company to invest, it’s not a good one. In spite of accusations of scam against MaxBounty, I don’t think they are. The company is a legitimate company with real offers for its target clientele. It’s just that their strict regulations and inevitable errors, alongside with the number of unsolved concerns on various forums, it uncontrollably collected negative feedback against them. That also gave them a bad image despite the efforts to keep their reputation as great as possible. In contrast to the allegations, MaxBounty has a real system with a legitimate payout for their affiliates just as Legendary Marketer does. There are many bloggers who benefited from them by giving the company real traffic, not the questionable and bought types of traffic. If they have been doing their shady business, I don’t think they could have survived the industry up to this date. Investing time, effort, and money on risky lead generation business either as an advertiser or as an affiliate is something that’s not recommendable to most money-making bloggers. This is because the industry itself is highly competitive, which is rather not an advisable move, especially to new bloggers. To keep away from that type of risk, it’s best to seek for more income-generating opportunities that will give you a steady form of residual passive income per month without having the need to compete with billions of people every single day. All you need to do is to improve your traffic-generating skills by learning the basics of Search Engine Optimization (SEO) and other necessary skills to keep your edge against others. Other than that, you don’t need to hover a ton of industries and start your guessing game. Roope “Robert” Kiuttu has been a successful affiliate marketer over the past 4 years and founded Your Online Revenue Ltd at the age of 21. He didn’t have to go through the hellish lead generation business and rather put himself into the business owner perspective. Recently, he earned more or less $2,000 within 20 hours after he affiliated with this FREE program. The same program he’s going to share with you as a great business opportunity this year. Are you ready? Are you stoked? If so, click the green button below and get started today. Change your life and gain financial freedom from your day-to-day dread. Now that I shared my thoughts in my “Is MaxBounty a Scam?” post, it’s time to turn the table and ask about your experience with this company, in general. What kinds of experiences do you have with MaxBounty? Are they worth your time, money, and effort? Do you prefer to begin earning your first passive income through affiliate marketing or you rather invest in joining any CPA network company as MaxBounty?